For The Good Hawaii Wedding Planner, Richel, discusses the design process from concept to day-of execution of a Bella Sophia Estate Wedding. We were so excited to get to do a wedding at the beautiful Bella Sophia Estate. 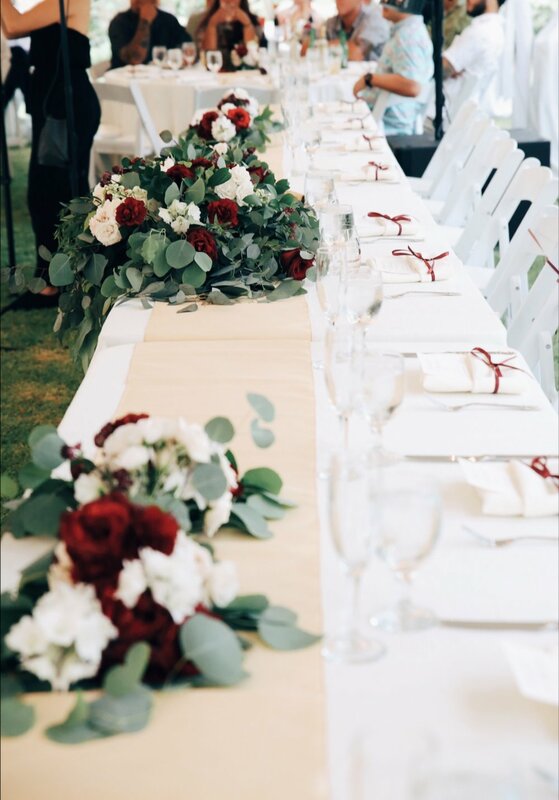 Our bride loved the deep reds, Marsala, and romantic feel. We wanted to make sure that we stayed true to the description of what the bride wanted, while finding a way to make it all work in the space. We also wanted to surprise the bride with some extra touches, so with the help of our amazing friends at Accel Party Rentals, we upgraded her linens and added beautiful table runners! We wanted to maximize use of the space in the venue, while making sure everything flowed smoothly. Because the couple opted to do traditional round tables and a head table, we built the design around the dance floor as the focal point (the couple loves EDM and had an awesome performance planned). We also thought about how the guests entered the property and wanted to make sure that their experience from arrival to departure was seamless. Working with a private estate, there are certain regulations that we have to follow. For example, nothing was allowed to be staked into the grass. This just means that we have to take extra precautions when building our layout to ensure that we take into account the alternative ways to weight down the tent. Also, we wanted to take advantage of some of the built in features that the venue had to offer, such as the wooden deck that we turned into the bar.